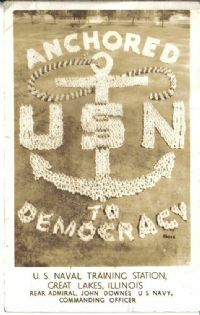 Here's a neat old military propaganda postcard from World War One! It is a vintage 1918 postcard. It pictures an artist drawn view of a US soldier with bayonette chasing a German officer and Daschund dog! Card front is artist signed Wall. Front of postcard reads "I'm sticking to the job". Back of card is divided postmarked "Battle Creek Mich Custer Br. Oct 28 1918". Condition-Good with several light creases. This is a nice old military snapshot photo! Although not a postcard, it pictures a sharp image of an old military transport bus. Camp Kilauea was the Hawaiian camp used to house suspects inmvolved in the Pearl Harbor bombing. Shortly after the bombing in 1941, policemen and soldiers began rounding up Japanese "suspects" in Hawaii and interning them at Kilauea Military Camp, located near Kilauea Volcano on the island of Hawaii. Internees were guarded by soldiers with bayonets, 24 hrs a day. This orig. snapshot measures approx. 2.5"x4.5". Back of photo is blank. Condition-Very good with glue marks on back. #313 RP WW1 Camp Funston KS w Autos 1917!!! Here is a super Real Photo WWI military view! It pictures Camp Funston in Kansas around 1917. Easily seen is the military base buildings in the background. In the foreground are lots of 1915 era autos and trucks! Also a few horse drawn wagons! Front reads "Scene at Funston". Back is undivided and postmarked "Stamford Neb. 1917". Condition is fair with several creases as shown Upper left and right corners), but possibly a rare image. Do not miss out!